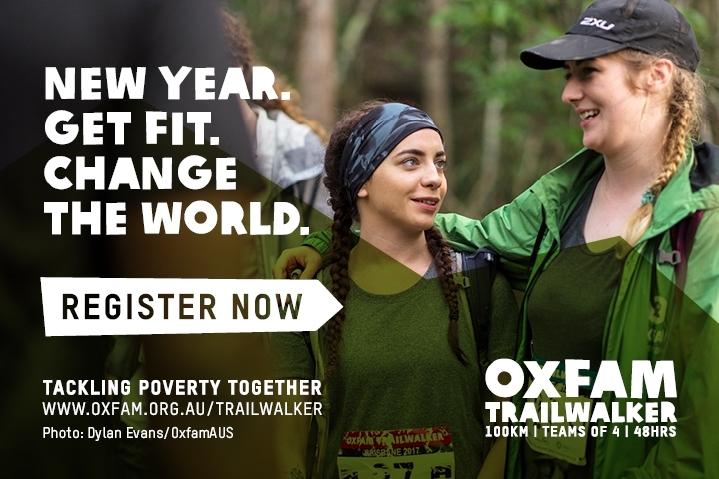 Entering an event such as Oxfam Trailwalker for the first time is exciting! Whether it was an instantaneous decision or one you took weeks to make, your excitement will no doubt be tinged with nerves. You may even be thinking “what have I got myself into?” (don’t worry - that’s normal!). Team dynamics is critical to your enjoyment and ultimately your success! I have seen long-standing friendships disintegrate after personalities clashed or expectations weren’t met on the trails. It doesn’t matter how long you’ve been friends. When it’s 3am, everyone is exhausted and a team member feels left behind (or others feel frustrated waiting for them), things can get ugly, quickly. Is it the goal to achieve a certain time or simply to cross the finish line together regardless of how long it takes? Be clear on your team’s objective. It can prevent fractures in the team later on. Aim to train on your own (which is great for mental toughness) and, if possible, with your teammates so you’re aware of the team’s dynamics before race day. Train on the course if possible. Otherwise, find trails that most closely resemble the terrain of your event. Trekking on fire trails every weekend won’t prepare you for the technical, hilly or rocky terrain. Think of recovery as an important part of your training too. So include a recovery (or easy) week every 4 weeks to give your body (and mind) a rest. Sleep is one of the best things you can do to help your body recover from your training. So get as much sleep as you can during the week (aim for 8 hours and don’t let yourself fall asleep on the couch at night!). And try to squeeze in a nana nap on the weekend (even 30 minutes will make a difference!). It could rain on race day so don’t let rain discourage you from getting outside to train. Think of it as a great opportunity to test your gear and find out if you get blisters when your socks get wet! And don’t forget to do at least one session each week carrying all your mandatory gear. You’d be surprised how many people forget to do this! You don’t want to train with a light pack then pick up your pack on race day and realise how heavy it is! Finally, make sure your training is based on the demands of the event, and not your fear and self-doubt. Too often I see women do too much training without adequate recovery (and very often, get injured or sick) because their fear of not being “ready” or “good enough” clouds their judgment about their training. Fundraising can be glossed over in the early stages of preparing for an event like Oxfam. However, it can be a source of contention amongst the team so make sure you discuss it early in your planning. Will each member raise 1/4 of the total amount? Or perhaps you’ll jointly host a few events to raise the full amount? Draw on the natural strengths of each team member too. Not everyone will be comfortable posting about the event on Facebook. But instead, they might be happy to call local businesses and ask for their support or donations. Yes, gear can be expensive, especially if you don’t own much (or any) of the mandatory gear when you decide to enter the event. However good quality gear is worth the investment. There is nothing worse than realising the jacket (you thought was a bargain) is too heavy for the conditions (so much that you sweat under it), making it practically useless for the event AND then having to buy a new one! The most important investment you can make is in your shoes. Look for trail shoes (as opposed to hiking boots). They are lighter and softer on the base of your feet which you’ll appreciate after 12 to 30 hours in them! Consider having a second pair to change into at the halfway point. New shoes and socks can make you feel like a new woman! Crew choice is almost as important as the choice of your teammates. You want people who love you but won’t be offended if you are grumpy at 3 am! Having been on both sides of the fence (crewing and participating) I can honestly say crewing is just as exhausting. So if possible, have multiple crew members available so one can rest while the others meet you at the next checkpoint. Minimise the amount of stress for you, and your crew, by having a separate bag for each checkpoint (labelled with your name and the checkpoint number). You might also give your crew (or leave in your bag) a list of things you might need or want at each checkpoint. In the middle of the night, both you and your crew will be exhausted and no-one will be thinking clearly. So the more you can do to prepare ahead of the event, the better for everyone! - That the team will travel as fast as the slowest person. In fact, put them at the front of the group and have them lead the way (adopt a “no woman is left behind” policy). The quickest way for team dynamics to break down is for someone to feel they are being left behind (or for others to get frustrated because they have to stop and wait, and risk getting cold in the process). Also remember each of you will, at some stage, hit a ‘dark spot’ and feel exhausted, tired and flat. So the fittest team member may not necessarily be the fastest the whole race! - Those hotspots on your feet are a priority so everyone should feel free to speak up as soon as they notice one. This might seem unnecessary to discuss. However, it’s common for women not to speak up about a hotspot for fear it will inconvenience or slow the team. However, it’s better to stop and treat the hotspot early, than for it to turn into a bad blister which can slow the whole team (because you’re reduced to a hobble) or worse, result in you having to withdraw because of it. - How long will you spend at each checkpoint? Have a crew member keep an eye on the time. It’s easy to lose 15 - 20 minutes if no-one is watching the time. And in races with 7+ checkpoints, that’s a lot of time! Finally, prepare to be tested physically, mentally and emotionally. But know the sense of pride and satisfaction you feel crossing that finish line with your friends will stay with you for the rest of your life.